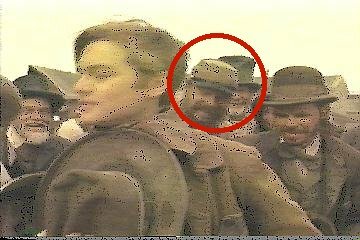 Leonardo Wilhelm DiCaprio had just turned 20 years old when shooting began on The Quick and the Dead. My impression of him was that he was young and immature (compared to the very mature Stone and Hackman). He seemed to take his role less seriously than the others. The extras even helped him with his lines on several occasions. He did get the job done, however, and gave a fine performance in the film. Leo (as he was called on set) often bummed cigarettes from the extras, including several from me. I went to see Titanic right after it was released. In that film, at one point Leo goes up to someone and asks if he can bum a smoke. I was the only one in the crowded theatre who burst out laughing aloud at this line. Leo still owes me some smokes.